Hey guys and gals! It's not a secret that I am the co-owner of ALL GLAMMED UP. Well, for those who do not know what it is, it's an online cosmetics shop which offers Original US Branded Makeup for a lower price. The other owner of this online is shop is one of my bestest friends, FASHIOMETICS. She is a Filipino fashion and beauty blogger based on the US. 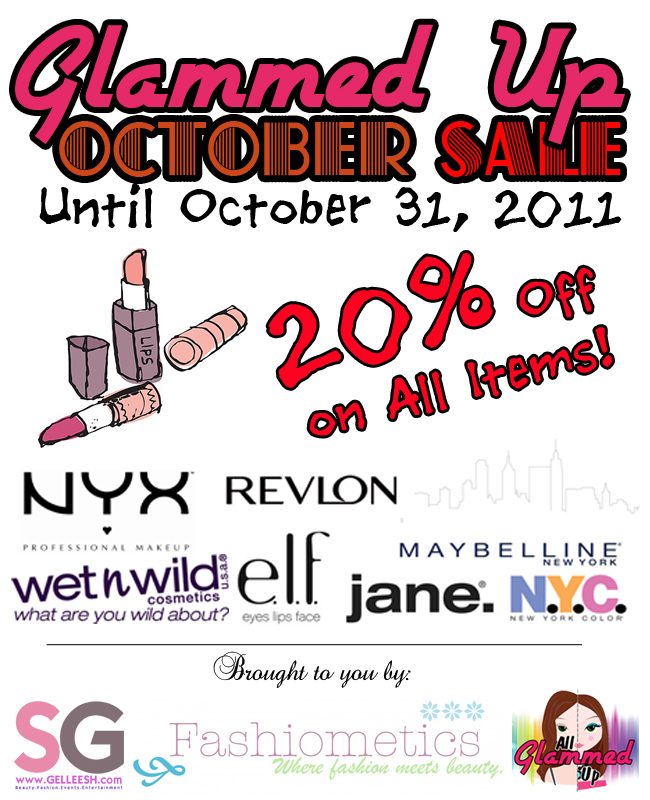 Basically, this post is to announce our GLAMMED UP OCTOBER SALE. We're giving out 20% off all our makeup brands: NYX, Revlon, Maybelline, Wet N Wild, ELF, Jane and NYC. Our original price is already very low plus this 20% off, this is a total bargain! That's not all. We have a surprise for our dear blogger supporters. If you blog about this sale, just provide us with the link and we'll give you an additional 5%. Now you've got a total of 25% off your purchase! Isn't that just amazing? Please take note that when you browse our website, products are still in its original price. You can just compute the discount and round off to eliminate the decimal, okidoks?